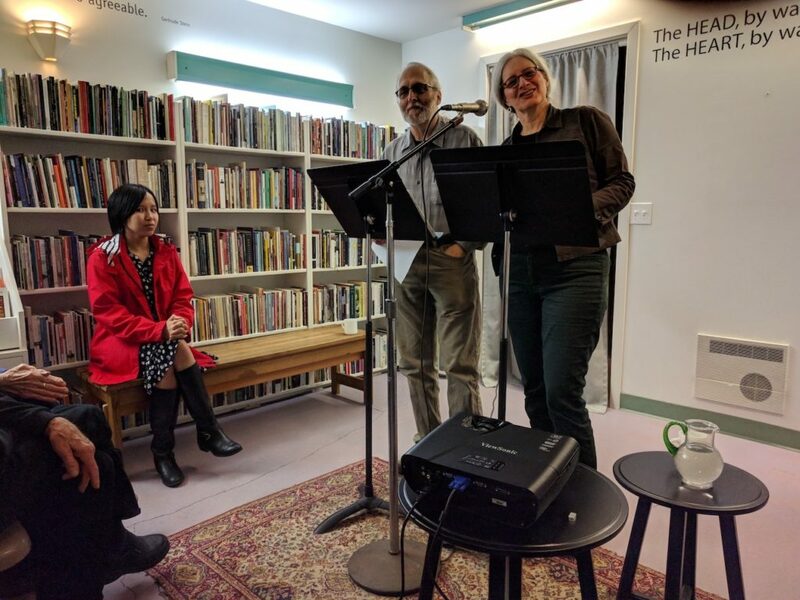 Always a pleasure to have a reading at Open Books, but last night was especially so as we launched our first play, Vicinity/Memoryall by Christine Deavel and J.W. Marshall. 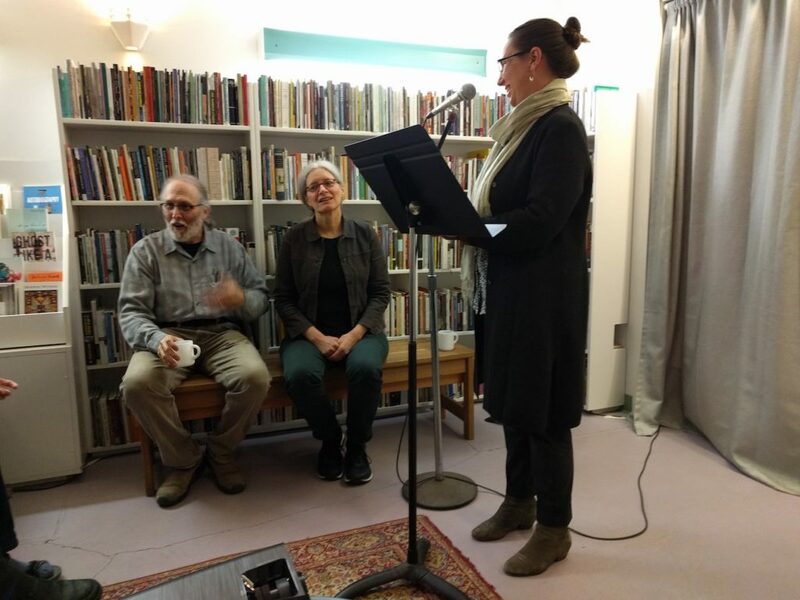 Years ago, when I was still quite young and new to Seattle, I started going to Open Books… and through time and many dozens of books later, have been friends with these two kind and generous people. As someone who never had much poetry in college and never completed a degree, I can say, that they are the biggest influence I have had in my poetic education. It has been a wonderful honor to publish a their first play and to have the type of collaborative experience I was hoping for when starting this publishing enterprise. I have learned so much from them as we have worked through this process together. In addition to hearing pieces of their new play (to be produced in July 2019), we also screened Sarah Lintakoon‘s “Olive”. She was the winner of our Emerging Visions Award for 2018. While checking it a bit long, we were delighted at the ways Sarah creatively worked with very little budget and a team, to tell her own story about memorialization and grief. Finally, we also got to hear Christine sing her song, What the Moon Knows and her the musical variation composed by her father, R. Gary Deavel. Take a listen on Soundcloud. Entre Ríos Books is with Victor Chudnovsky and 2 others at Ciudad Autónoma de Buenos Aires. Heading back for a second day at Feria Internacional del Libro de Buenos Aires [Sitio Oficial]] — looking for other small presses with Erin L McCoy and Victor Chudnovsky. I LOVE THIS PRESS SELFIE! “Sausage is the worst thing for my heart— I should just stick to the beef” says the publisher in #Argentina. @crschultz509 @ferialibro @ErinLMcCoy @vchudnov We ran out of time as it closed a bit early yesterday, but we'll have some cool presses to share today, no doubt! LGBT section, some feminist work, and SO SO SO MANY BOOKS!!! We are an independent press in Seattle, Washington. We publish collaborations between poets and artists of all types. We also have an interest in publishing contemporary Argentinian poetry in translation and supporting writers with an interest in Argentinian culture and Jewish history in Latin America. Gay-owned and queerly run. Join Our Mailing List for Events, Books & Sales! © 2019 Entre Rios Books. All rights reserved.